Have you ever wondered if renting an apartment is a better financial decision than buying a home? The answer is complex and dependent on your circumstances, but there are many advantages to renting over buying. 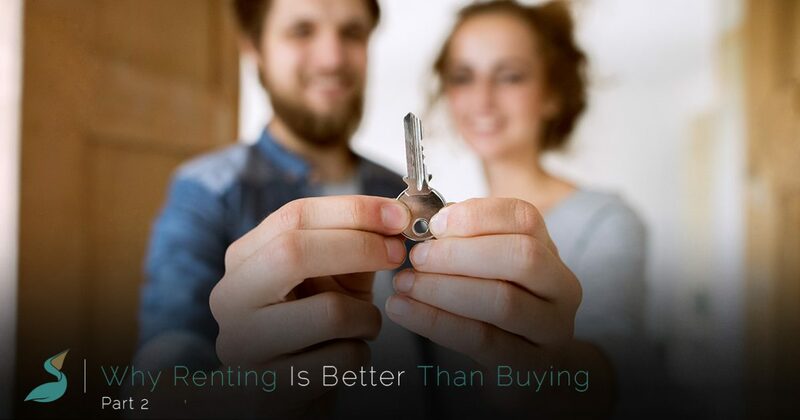 We provided you with a few reasons why renting is better than buying in a previous post, and in today’s blog, we’ll continue to explore that same topic. When you’ve finished reading this post, be sure to get in touch with the front office of our Windsor apartments to request more information! Whether you’re a young professional, or you’re older and are thinking about making a career change, flexibility is a major advantage of renting an apartment. Yes, you’re locked into a lease agreement of some kind, but subletting a few months is typically much easier than selling a home and getting out of a 30-year mortgage. If you’re suddenly laid off or land a big promotion in another state, then all you have to do is talk to your landlord about the next steps and how you can transfer your lease. Between a down payment, closing costs, and other fees and expenses required to get the keys to a new home in your pocket, many homeowners find themselves financially stressed. Most millennials and other renters don’t have between $20,000 and $30,000 to pay out-of-pocket, and when you rent, the most you’ll have to put down up front is money for a security deposit and a month or two or rent, depending on the complex. Plus, you’ll get your security deposit back as long as you take care of and maintain your apartment! Life sometimes throws us unexpected curveballs. Whether you find yourself unable to work, or you lose your job due to unforeseen circumstances, being unable to pay your rent is significantly better than going through the foreclosure process. You may be able to work out a payment plan with your landlord, and your credit score won’t be as significantly hurt even if you’re evicted. A foreclosure can lower your credit score for years, so always be sure that you’re in a financially stable position before you make the decision to purchase a home. Keeping your living space clean and tidy is an important part of maintaining your living space, but doing so is significantly easier in an apartment. Apartments are compact and space-efficient, providing you with the right amount of living space for your needs. Many of the homes on today’s market have excessively large floor plans that make daily household chores like dusting and vacuuming into an all-day affair. We hope that this series has helped you understand why renting an apartment can be a smarter choice than purchasing a home. Are looking for a new apartment in Windsor? Pelican Bluff is Windsor’s newest apartment complex, and we proudly offer luxurious living and million-dollar views of the surrounding area at an affordable price. With exceptional amenities and a friendly community, choosing to make our Windsor apartments your next home is an easy choice!